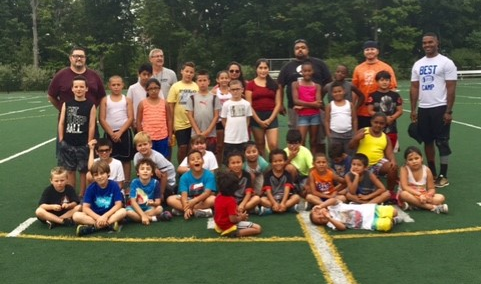 The Danbury Athletic Youth Organization offers a Speed and Agility Camp in the month of July for girls and boys from kindergarten age to incoming ninth graders. It is a way to increase coordination, improve speed and work on footwork. Athletes from all sports and children that are not involved in sports can participate. They will work on maintaining balance while working on skills. They will learn how to move all or part of their body quickly to build on speed and endurance. Building muscle resistance and eye-hand coordination will also be taught at this camp. Coaches from all sports participate and help train our youth at this DAYO Camp. We have coaches from Track & Field, Lacrosse, Flag and Tackle Football, and Soccer. It is a fantastic way for the children to stay healthy and active during the month of July, 2017. During the Speed and Agility Camp, participants rotate from station to station, with the opportunity to work on different skills and activities. Some of the stations include the agility ladder, catching a football while running, allowing for multi-directional speed and running a timed 40-yard dash at the beginning and at the end of camp to demonstrate speed increase. Other stations include utilizing the agility ladders to develop athletic footwork, and using the power fitness parachute for resistance training. Parachutes have been one of the athletes’ favorite stations. In addition to the above-mentioned activities, participants will be working on stretching, cones, hurdles and recoils. For this camp, all the kids need are a pair of sneakers, shorts and t-shirts. Participants can wear cleats but it is not mandatory. A bottle water is provided at the beginning of the camp and participants must bring their water bottle with them to every session. The Speed and Agility Camp is held Tuesdays and Thursdays in July starting July 6, 6-7:30 pm, at Kaplanis Field. If interested, please email Estela Camacho at EstelaGC005@gmail.com and she will email you a form. This article was written by Estela Camacho, Danbury Athletic Youth Organization (DAYO) secretary. For more information, visit www.dayosports.com, or contact Estela at 203-530-2457 or Bestelacamacho@sbcglobal.net.